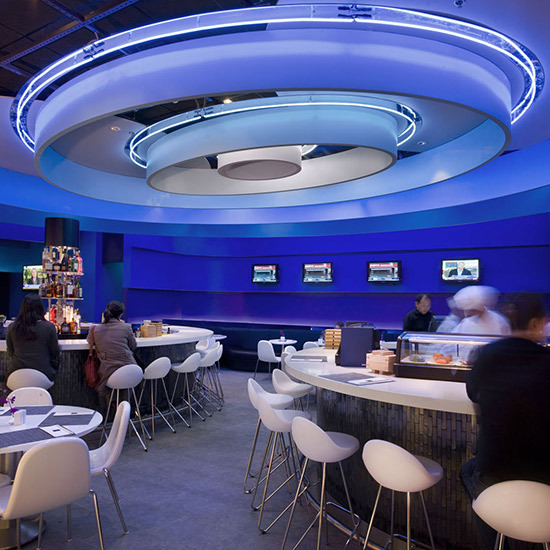 Terminal 5 · When it opened in 2008, JetBlue's Terminal 5 became the undisputed leader of a new era of preflight pampering. At Aero Nuova, Mark Ladner of Del Posto consulted on dishes like veal Milanese and lemon zucchini bruschetta. 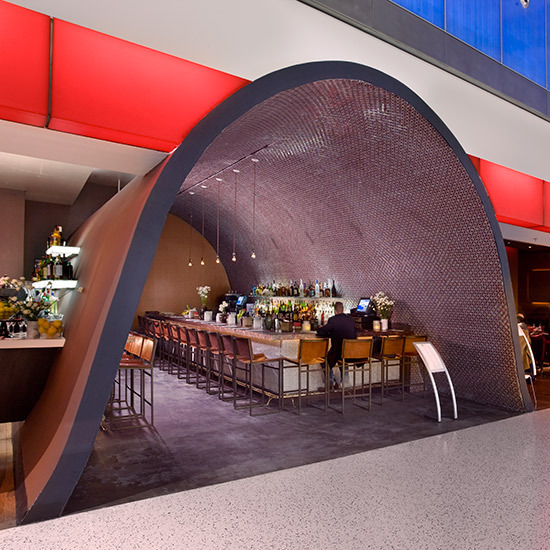 Terminal 5 · With its vaulted, tiled ceiling, Piquillo looks like the inside of a modernist wine cellar. Tapas and Spanish sandwiches evoke the food that chef Alex Raij cooks at her four restaurants, La Vara, Tekoá, El Quinto Pino and Txikito. Dishes include creamy croquetas and a flight-friendly bocadillo of serrano ham on a tomato-rubbed baguette; less portable but equally delicious is a fried-calamari sandwich with spicy mayonnaise. Terminal 4 • Celebrity chef Marcus Samuelsson, of Harlem’s soul food favorite Red Rooster and chicken joint Street Bird, expands into Queens with Uptown Brasserie—feeding hungry travelers with signature dishes like Fried Yardbird Chicken, comforting plates like Blackened Catfish and Grits, or a variety of sandwiches and burgers. Terminal 5 · Deep.Blue's extensive menu—overseen by Michael Schulson of Philadelphia’s Sampan—includes sushi, tempura, gyoza and entrees like Teriyaki Filet Mignon with asparagus and wasabi. 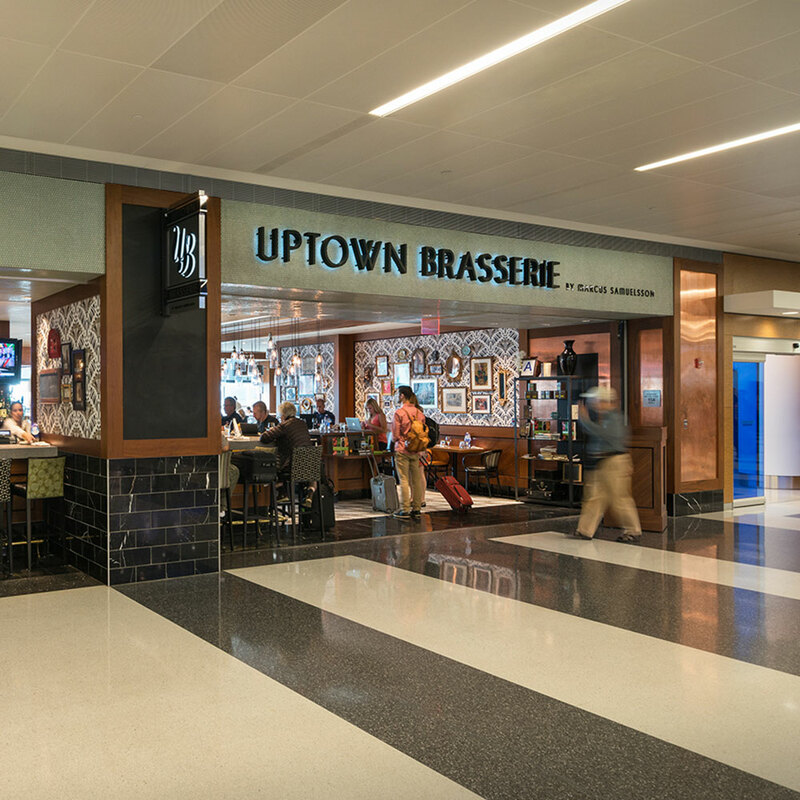 Terminal 5 · Brasserie La Vie is run by former chefs at NYC hot spots Balthazar and Pastis; French bistro dishes include Salade Niçoise and Sole Meunière. Terminal D · LaGuardia is quickly catching up to JFK, its Queens sibling, with a growing roster of restaurants spun off from local favorites. 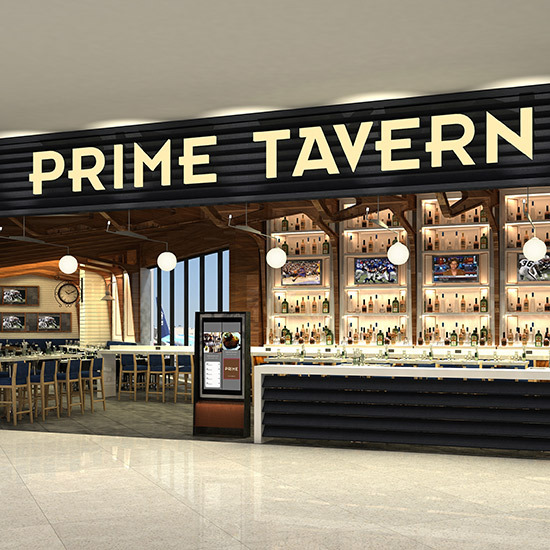 At Delta's Terminal D, chef Michael Lomonaco's Prime Tavern serves dry-aged steaks, custom-blended Pat LaFrieda burgers and lobster rolls. 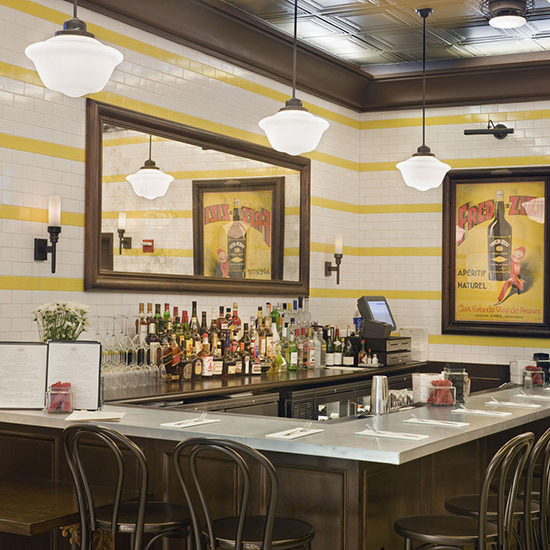 Terminal D · As the name implies, Custom Burgers by Pat LaFrieda—the butcher who supplies meat blends for Shake Shack, Minetta Tavern and other celebrated burger purveyors—lets you tweak your order to the limits of your imagination. Southern-style comes with fried pickles and barbecue sauce. 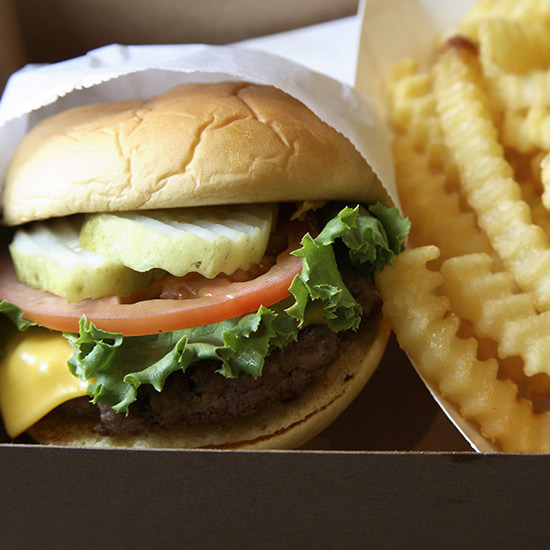 Add crinkle-cut fries and a velvety chocolate shake for good measure. 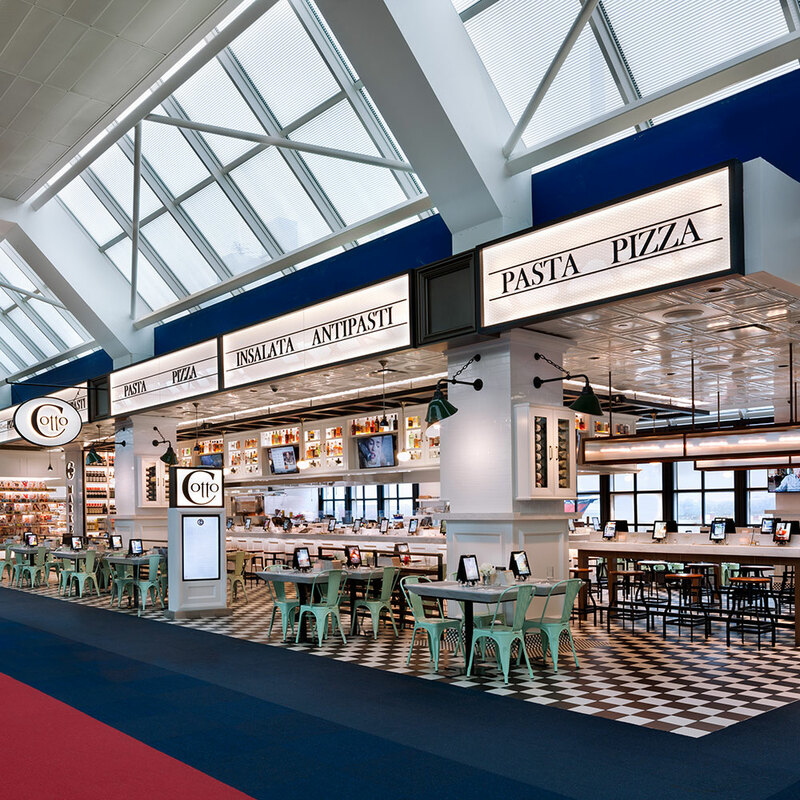 Terminal C • Chef Michael White of Marea and Ai Fiori presents Cotto, an Italian restaurant offering panini, antipasti and more. 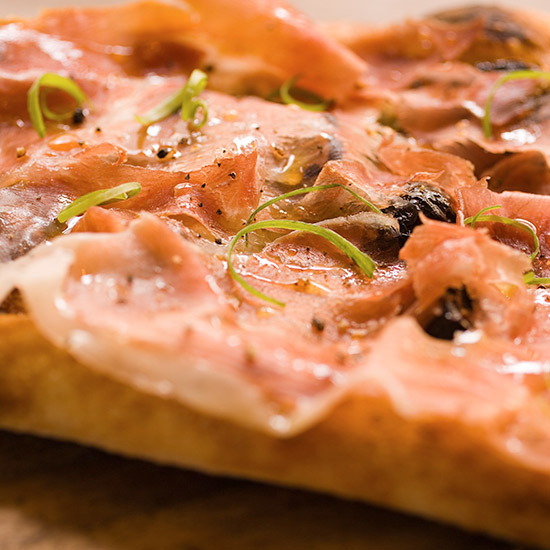 Highlights include the wide selection of white pizzas and the Garganelli with Radicchio and Truffle Butter. 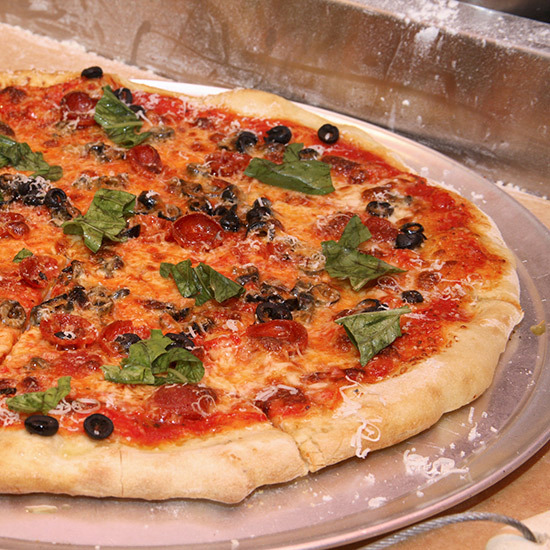 Terminal D · Tagliare serves Sicilian and thin-crust pizzas under the direction of Dominick DeMarco, Jr., whose father runs Brooklyn's iconic slice joint Di Fara. One of the specialties is baby-artichoke pie. Central Terminal Building · At the pre-security food court in the Central Terminal Building, F&W Best New Chef 1990 Todd English has an outpost of his Boston pizzeria Figs. 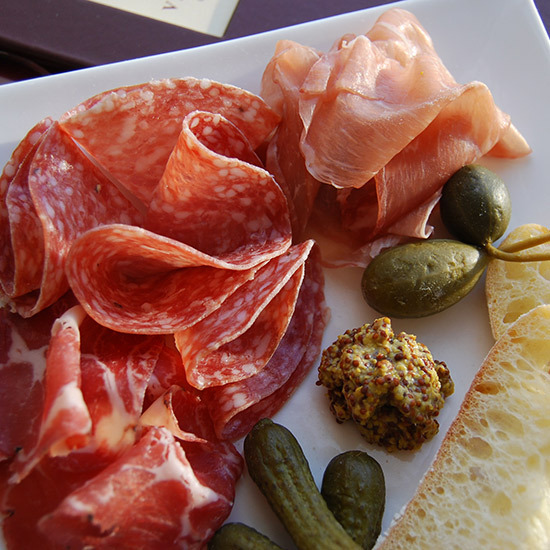 It has a view of departing planes and a menu with sandwiches, salads and pizzas with toppings like fig and prosciutto. Terminal C · Thanks to an overhaul spearheaded by United Airlines, Terminal C boasts perhaps the most competitive restaurants of all New York-area airports. Order an omelette, croque-monsieur or even roasted bone marrow at Saison, part of the Alain Ducasse restaurant empire. Happy Clam, overseen by Mario Carbone of ZZ’s Clam Bar and other NYC favorites, serves classic seafood and red sauce fare. 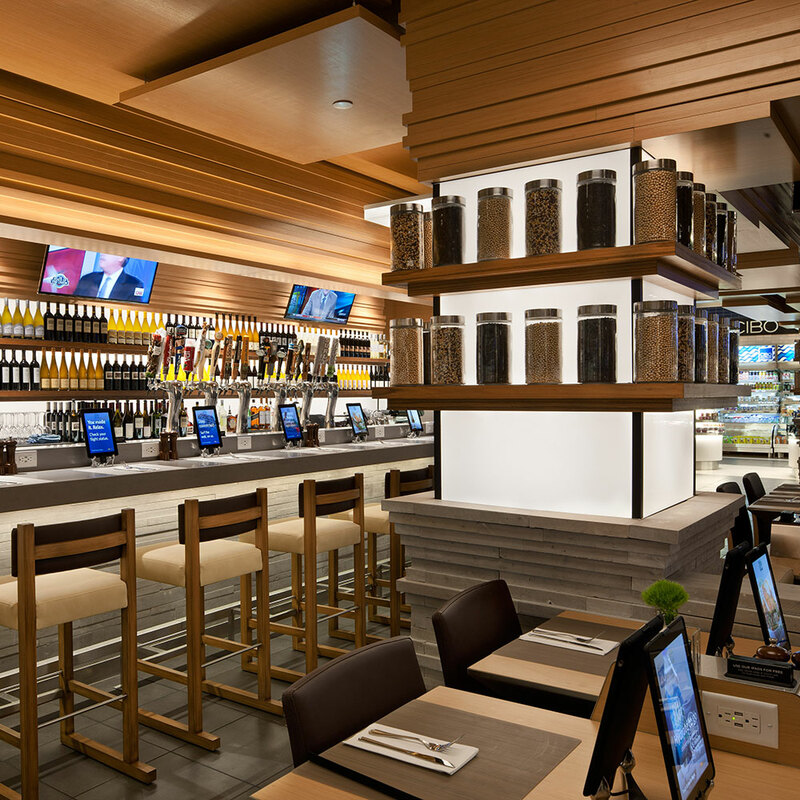 Plus, every seat in every restaurant in Terminal C comes with an iPad for easy ordering. 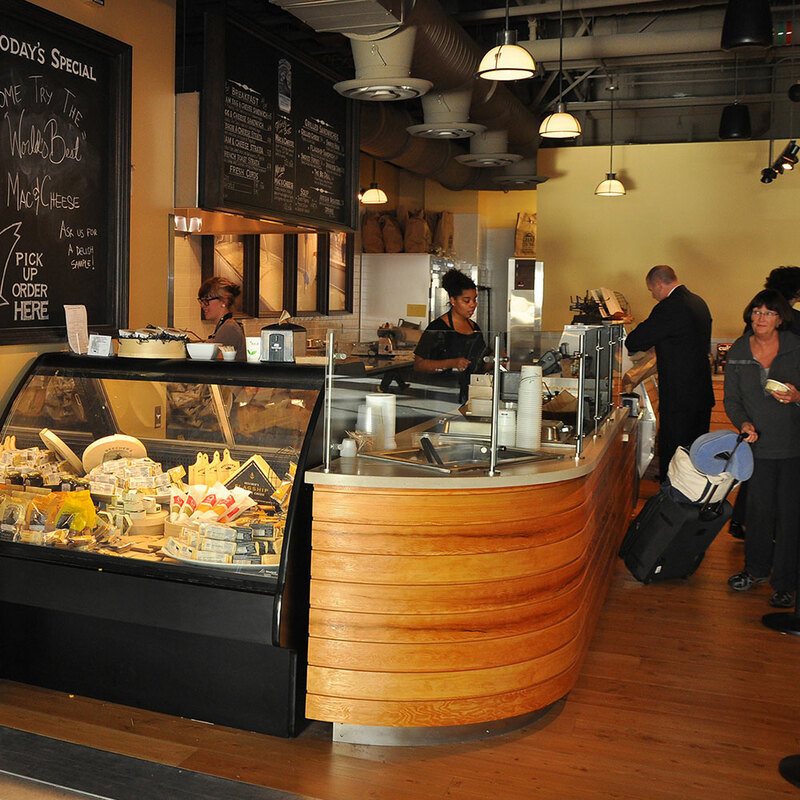 Terminal A · Legal Sea Foods, a Boston institution, runs Legal's Test Kitchen—an 80-seat restaurant that tests new dishes and offers take-out salads, wok stir-fries and sandwiches as well as Legal classics like clam chowder and fish and chips. 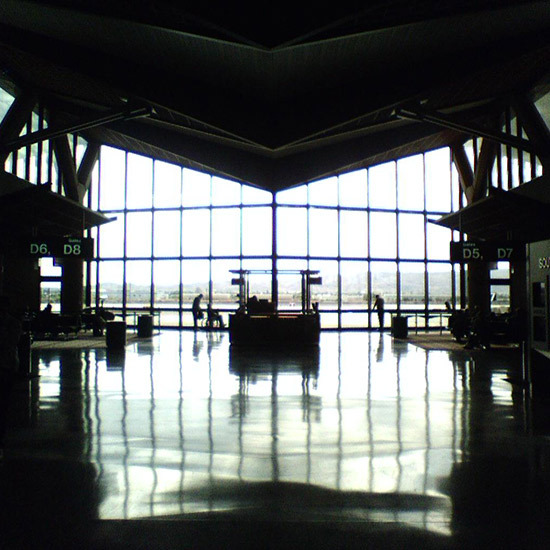 Terminal B · F&W Best New Chef 1990 Todd English was one of the first professional chefs to move into modern airport dining, serving dishes like tuna tartare tacos at his global-inspired Bonfire. 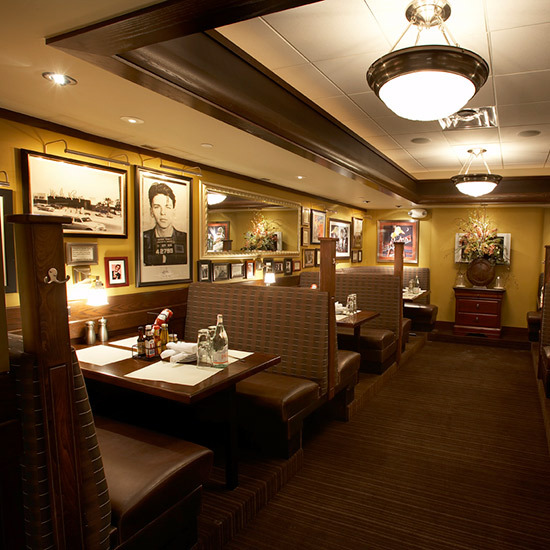 Terminals A, C, and E · Lively South Philly crab house, Chickie's & Pete's, now operates several airport outlets specializing in the original's chowder, cheesesteaks and Crabfries—french fries seasoned with crab-boil seasoning and served with a creamy cheese dipping sauce. 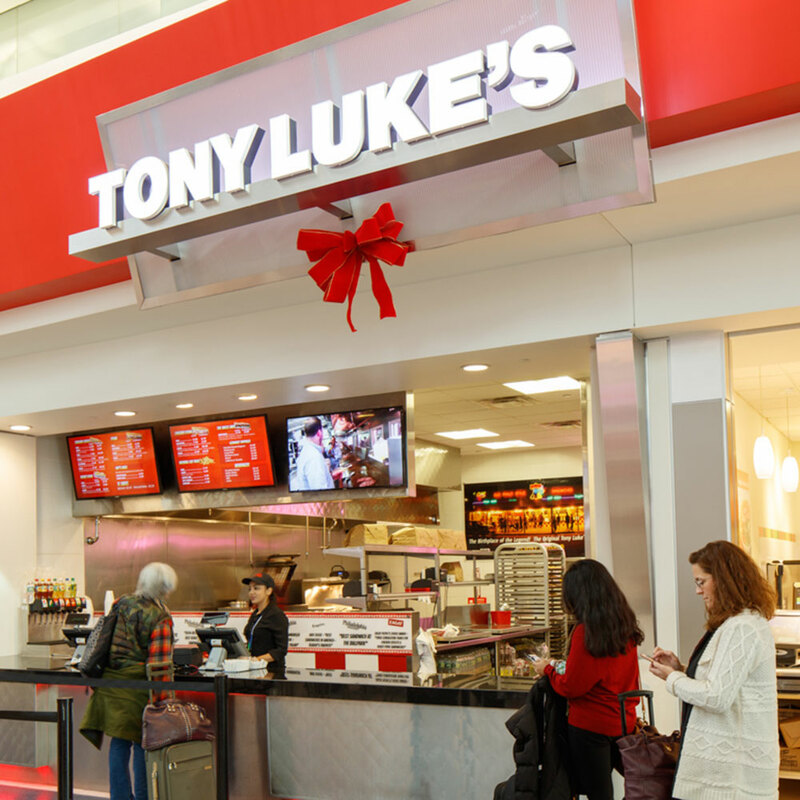 Terminal F • If you’re looking to indulge in a Philly classic before you head out of (or into) the city, head over to Tony Luke’s for the full panoply of cheesesteak variations. The place, of course, also serves the sandwich many claim is the original version, with roast pork, provolone and broccoli rabe. 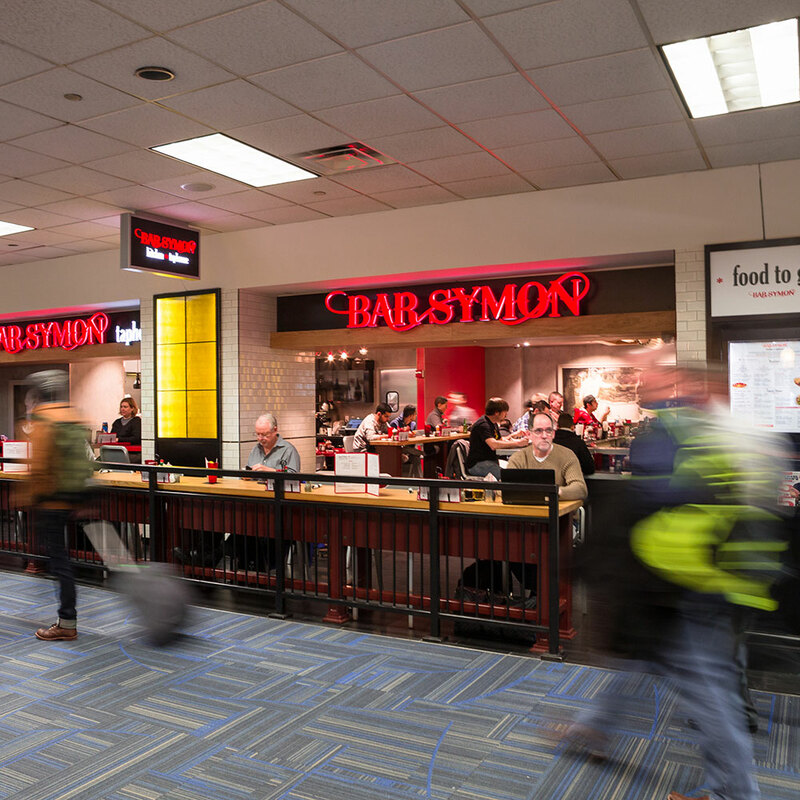 Concourse D • The Chew host Michael Symon feeds DC-area travelers with burgers, pierogis, pulled pork sandwiches and other tavern fare at Bar Symon. Find classic French cuisine at Bistro Atelier, with steak frites, croques monsieur, and crepes with savory fillings like duck confit or escargot. Concourses A and B · Washington, DC-based chain Five Guys makes flavorful burgers and hand-cut fries to order and offers free peanuts. 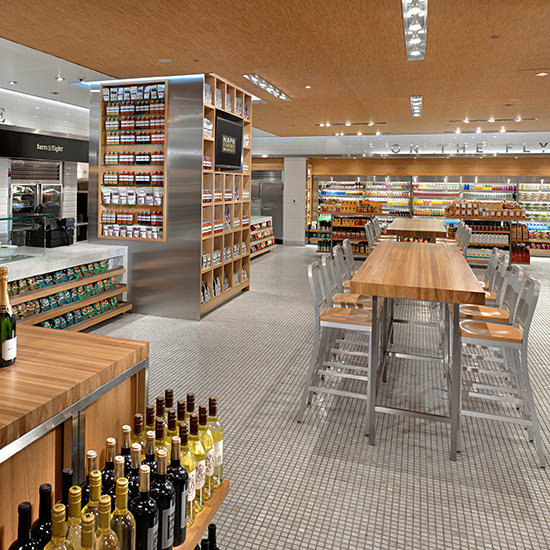 Concourses B and C · Like many airports, Dulles has welcomed a Vino Volo tasting room—this one is notable for offering a tasting flight of wines produced nearby in Virginia. 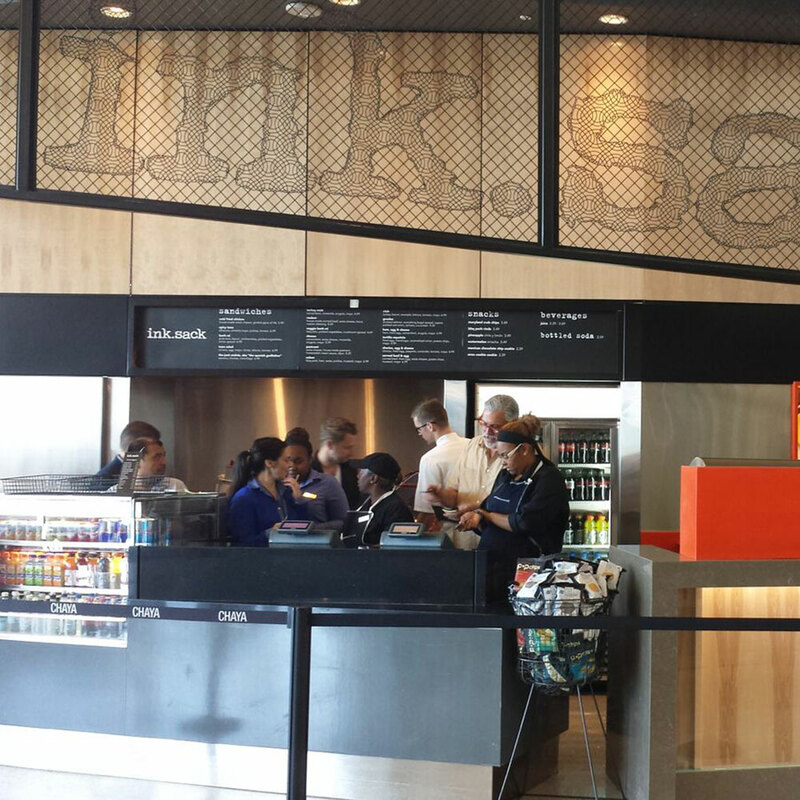 Concourse E · Sushi spot One Flew South is Atlanta's first upscale airport restaurant, complete with a menu created by chef Jared Hall, former chef de cuisine at Asante (reopening in 2017). 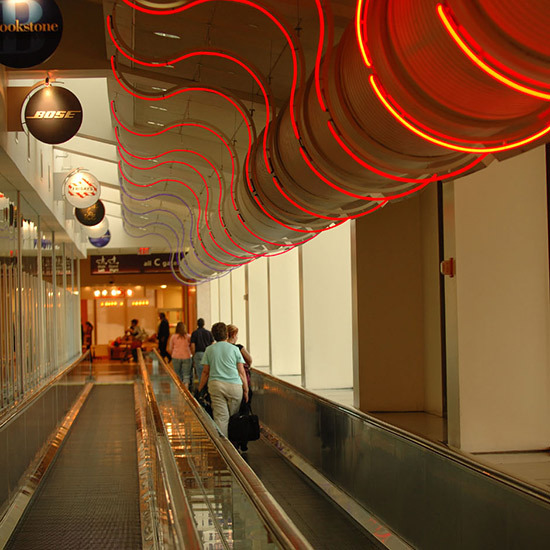 Concourse A and Main Terminal Atrium · Atlanta institution Paschal's Restaurant, which even markets a local line of batter mixes for fried chicken, serves large portions of southern classics like fried catfish, country-fried steak and macaroni and cheese. 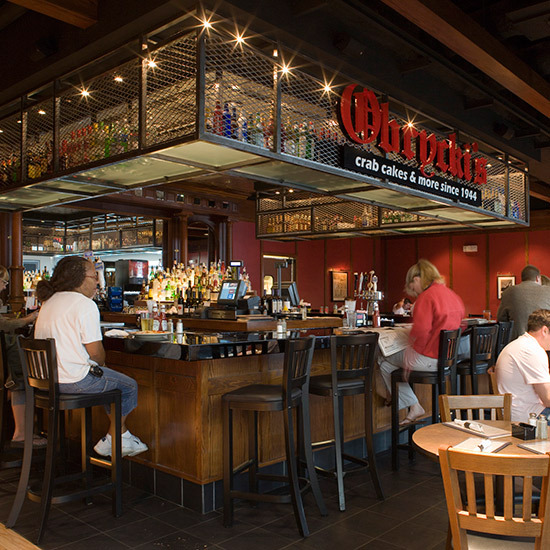 Concourse B · You can't don a bib and brandish a mallet over a tableful of crustaceans like you can at Obrycki's original Pratt Street location, but you can still enjoy the popular restaurant's portable, less messy options: luscious crab cakes, crab dip and more. Main Terminal Atrium · Brookwood Farms BBQ Lines of hungry flyers attest to the deliciousness of the Carolina-style barbecue served up here: pulled pork, beef brisket and chicken are among the offerings. 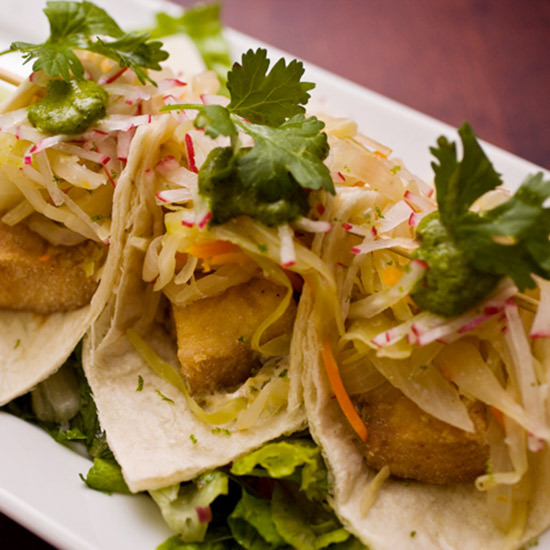 Don't miss the fried pickle garnish. 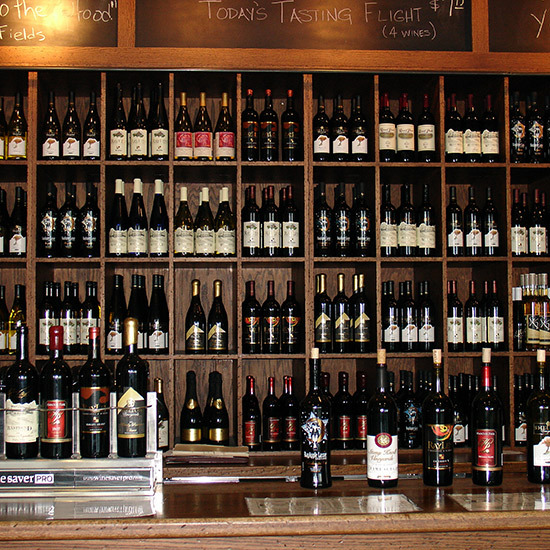 Connector Between Terminals D and E · Yadkin Valley Wine Bar offers flights, glasses and bottles from North Carolina's growing Yadkin Valley wine region, featuring producers like Shelton and Biltmore. 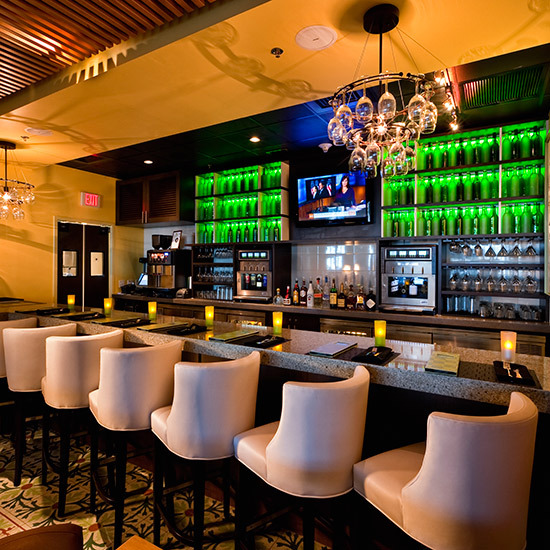 Terminal D · The US debut of the Belgian wine bar Beaudevin serves Mediterranean food to eat there or packed to go. 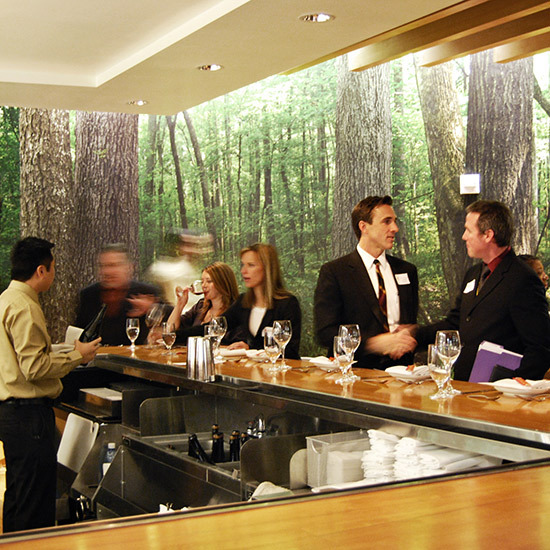 The extensive wine list rotates seasonally. 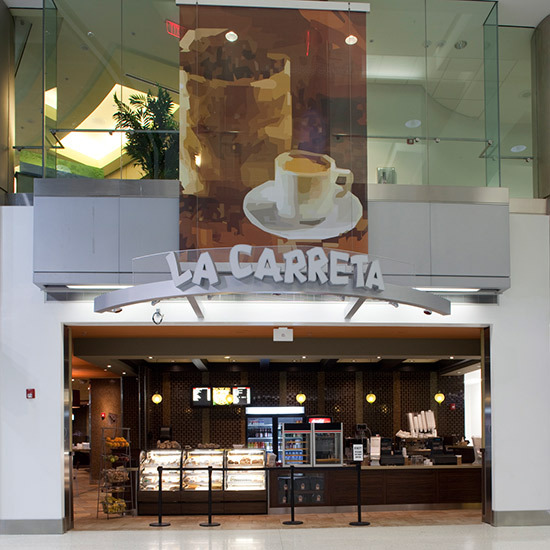 Terminal D · The airport outpost of Miami's well-known Cuban chain, La Carreta, serves favorites like pressed, portable French-bread sandwiches including the Cubano, made with roast pork, Swiss cheese and pickles, and the smaller medianoches ("midnight" sandwiches) made with ham, cheese and pickles. 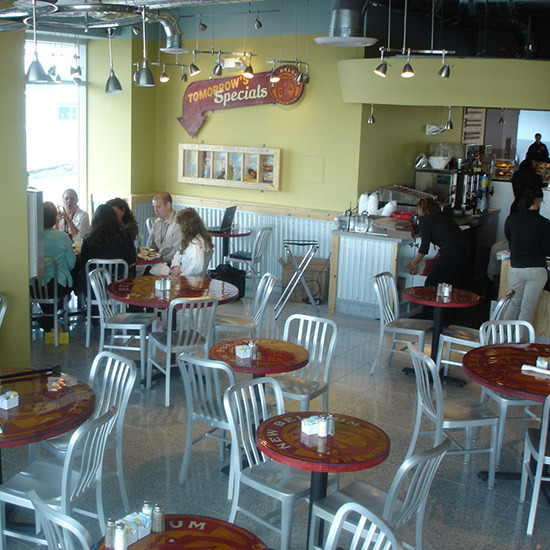 Terminal 1 · Berghoff Café was opened by German brewer Herman Joseph Berghoff in the 1880s—and the current location in the airport is very close to its original home, on the corner of State and Adams streets. 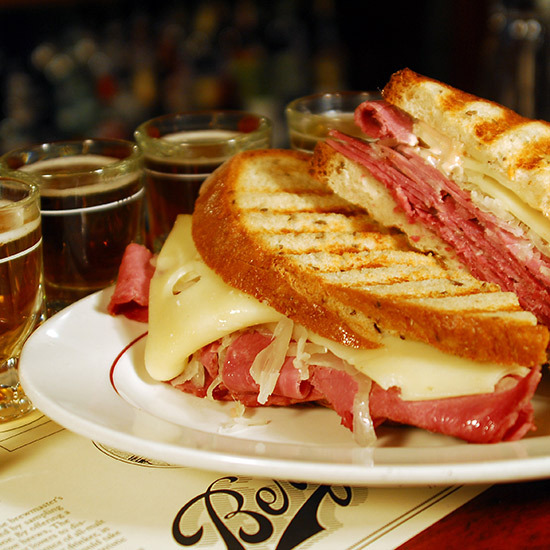 Beyond Berghoff's beer on tap and root beer, there are hand-carved roast beef, turkey and corned beef sandwiches and the house specialty: the Reuben. 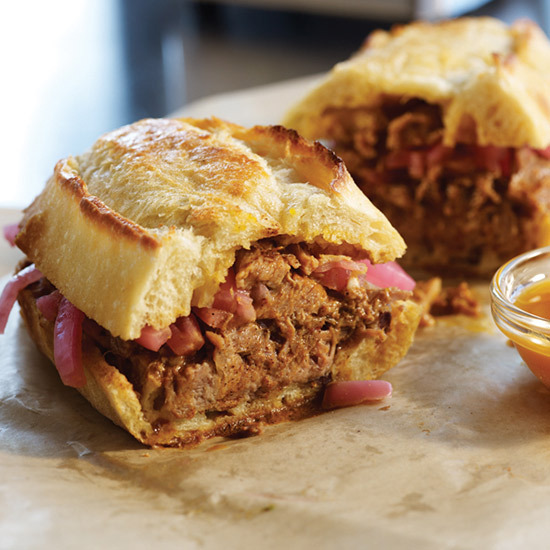 Terminals 1, 3 and 5 · At Tortas Frontera, Mexican-food master Rick Bayless serves tasty griddled sandwiches (a.k.a. tortas) three traveler-centric locations. 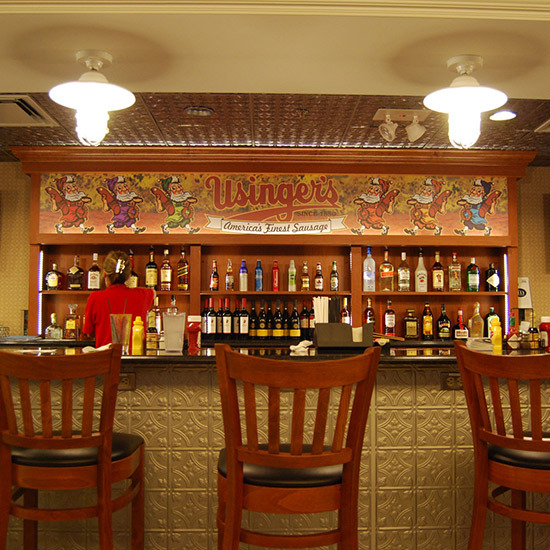 Concourse D · Nothing says Milwaukee like brats and beer, and Usinger's offers prime examples of both. Founded by a German immigrant, the company has been producing tasty bratwursts, knockwursts and summer sausages since 1880. 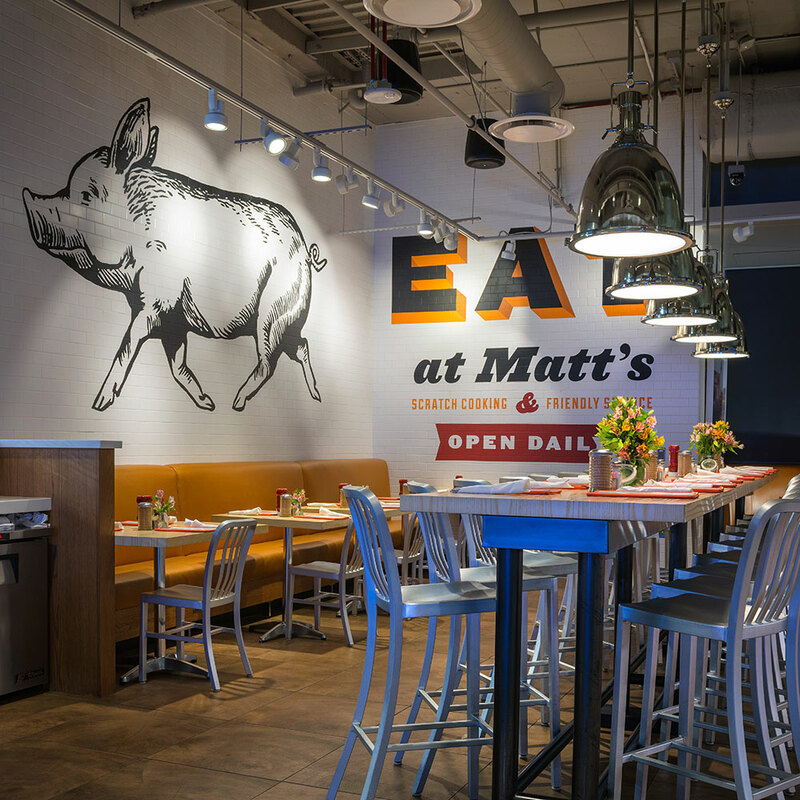 At the airport location, MKE travelers can indulge in a quick pastrami sandwich to go, or pair a brat with a beer at the bar. Terminal 1, Concourse G • Chef Koshiki Yonemura Smith, of St. Paul Japanese restaurant Tanpopo, serves sushi, bento boxes, udon and more at Shoyu, his Japanese restaurant in Minneapolis-St. Paul International Airport. Try the Wild Acres Duck Pho. Also in Concourse G is Mill City Tavern, where you can try regional beer and craft cocktails as you snack on small plates like Steelhead Trout Gravlax and Bison Tartare. 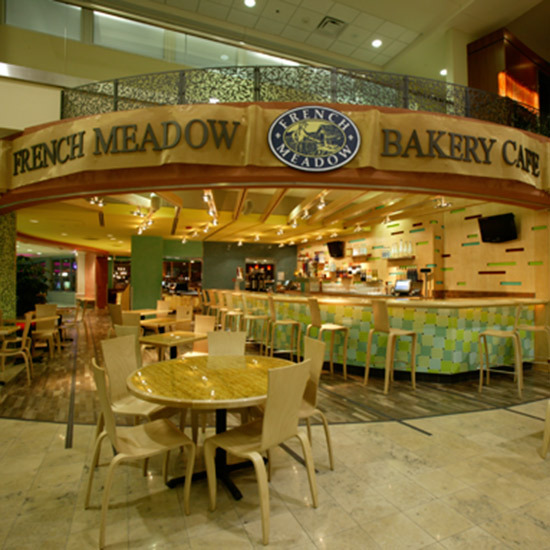 Concourse F · Minneapolis-based French Meadow Bakery & Café bills itself as the longest continuously running certified organic bakery in the country; the airport outpost serves baked goods like warm seasonal fruit crisp as well as savory dishes such as pan-seared walleye with Minnesota wild rice. The Mall, across from Checkpoint 1 · If Mad Men's Don Draper had a layover in Minneapolis, he might come to Ike's Food and Cocktails. 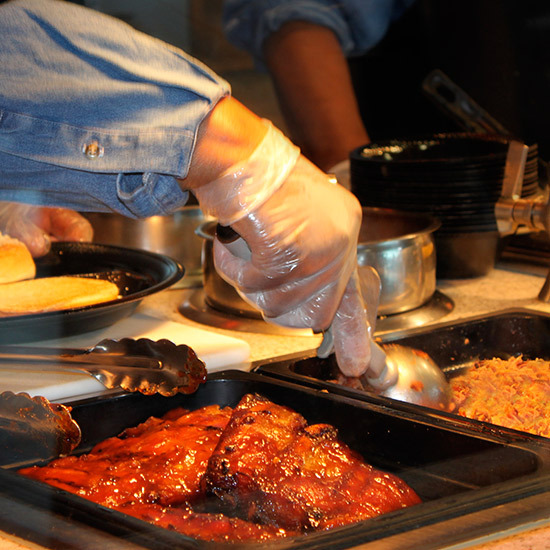 The airport branch of Ike's doesn't stray far from the formula that makes the downtown original a local favorite: old-school décor, reliable comfort food (steaks, burgers, pot roast) and potent potables. 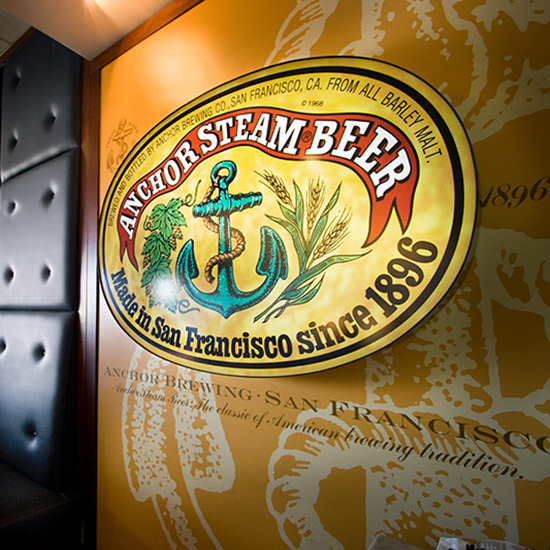 Concourse B · The Denver airport has half a dozen taverns featuring Colorado's microbrewed beers. The artsy bar and grill New Belgium Hub serves Belgian waffles for breakfast. At lunch, you can pair chicken sandwiches and oversize salads with Fat Tire Amber Ale and other award-winning beers from local New Belgium brewery. Concourse C · A branch of decades-old Denver favorite Tamales by La Casita sells supercheap red-chile-and-shredded pork or green-chile-and-cheese tamales. Terminal 4 • If you’re totally jetlagged and don’t quite know what time it is, you can get breakfast all day at Matt’s Big Breakfast, a Phoenix favorite that offers plenty of omelets and waffle dishes in addition to the “Matt’s Biggest Breakfast” special with three eggs, bacon, sausage, home fries and a pancake. Terminal 4 · Mother and daughter Carmen and Lorraine Othon's green-chile tamales have been drawing crowds to El Bravo restaurant in Phoenix's Sunnyslope neighborhood for nearly 30 years. Now, Lorraine's daughter, Monique, serves those same tamales–prepared earlier that morning in the original location–at El Bravo's airport outpost. West Concourse · 40-year-old Driftwood, Texas, institution, The Salt Lick, has brought its barbecue—most notably its supertender brisket—to Austin's airport. 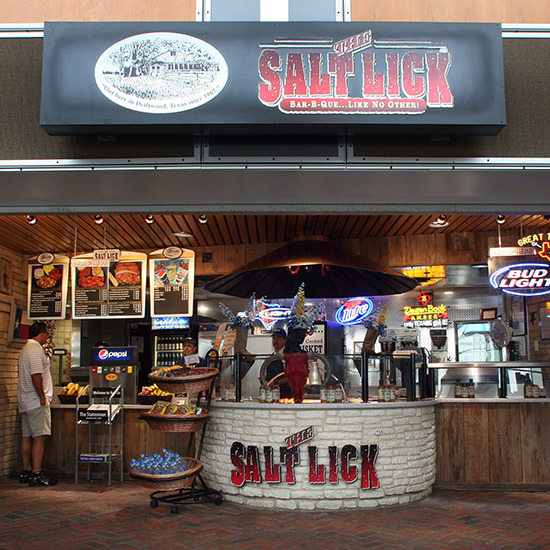 The Central terminal also features a Salt Lick Taco Bar. 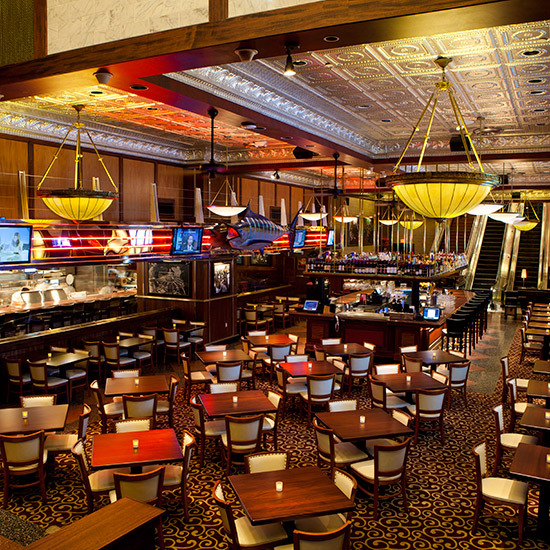 Terminal A · Cajun-themed chain Pappadeaux Seafood Kitchen serves Bayou favorites like shrimp étouffée and fried alligator. 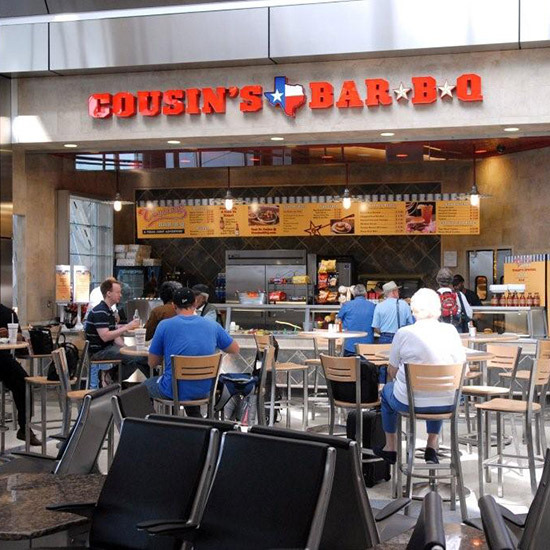 Terminals B and D · Cousin's Barbecue offers Texas barbecue standards like smoked brisket, pulled pork and pinto beans. 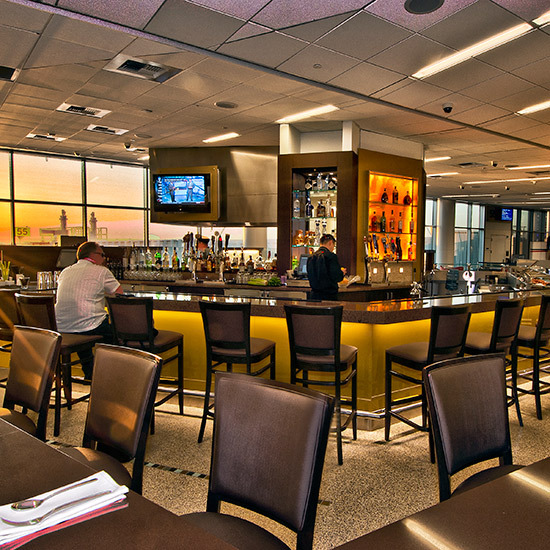 Terminal D • At Sky Canyon, enjoy the cuisine of chef Stephan Pyles, a local Dallas star known for restaurants like Stampede 66 and Flora Street Cafe. The menu includes ceviche, tacos and tex-mex “Texas Classics” like tortilla soup, Frito chili pie and barbacoa. 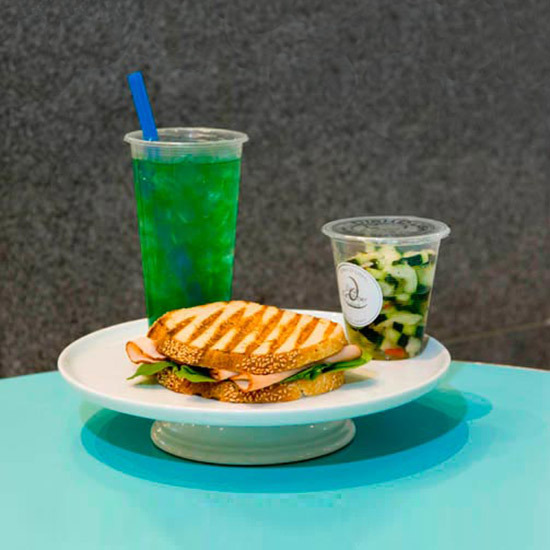 Tom Bradley International Terminal • Chef Michael Voltaggio brings his sandwich place ink.sack to LAX, offering selections from its original location including pork banh mi and a ham, egg and cheese with camembert and prosciutto. 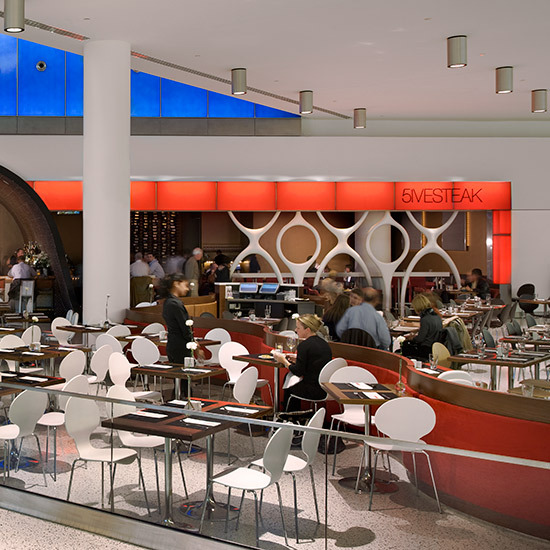 • Terminal 2 •Meanwhile Slapfish, LA’s popular “modern seafood shack,” offers innovative fare like lobster breakfast tacos alongside classics like shrimp and grits. Terminals 1 and 3 · Well-known L.A. spot La Brea Bakery makes fantastic sandwiches. Main Terminal North Lobby • Northeast Portland favorite The Country Cat, beloved by locals for its excellent Southern-influenced seasonal cuisine, has plenty of vegetable-driven options, like Radish Leaf Ravioli, as well as an extensive meat and seafood menu featuring Crispy Fried Willapa Bay Oysters and Cast-Iron Skillet Fried Chicken. 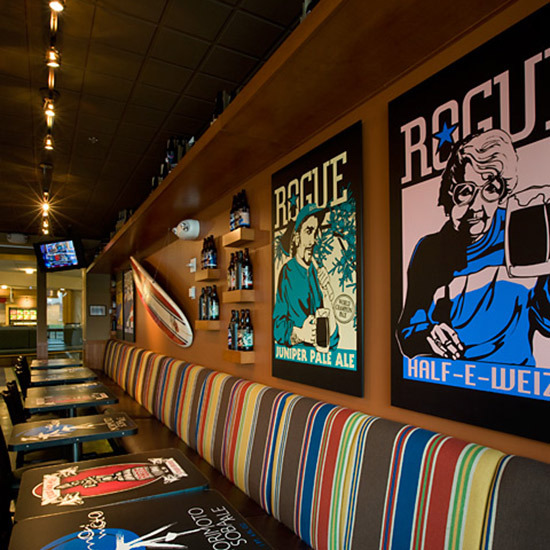 Concourse D · The funky Oregon brewery Rogue produces some of the best craft beers in the country; the Rogue Ales at PDX has gastropub dishes like Kobe beef burgers topped with local Rogue Creamery bleu cheese. Terminal 2 · In the back of Napa Farms Market, Tyler Florence Fresh (an outpost of his Napa restaurant) has a bagel bar for breakfast and rotisserie chicken with market-driven sides for lunch and dinner. 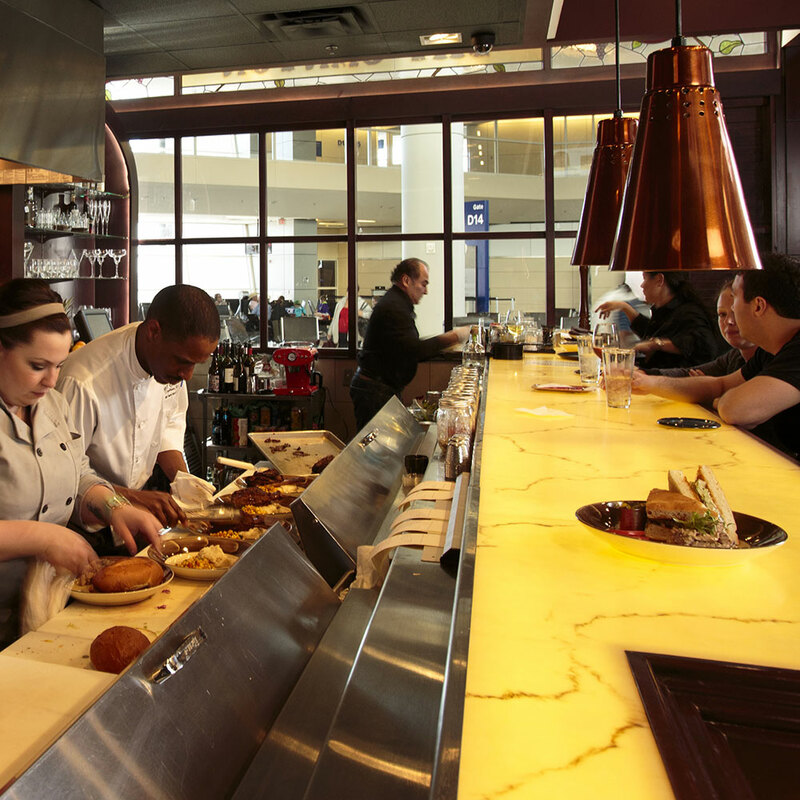 Terminal 1 · Perry's tavern is known for its Cobb salads and The Perry’s Burger which can be topped with bacon from Zoe’s Meats. 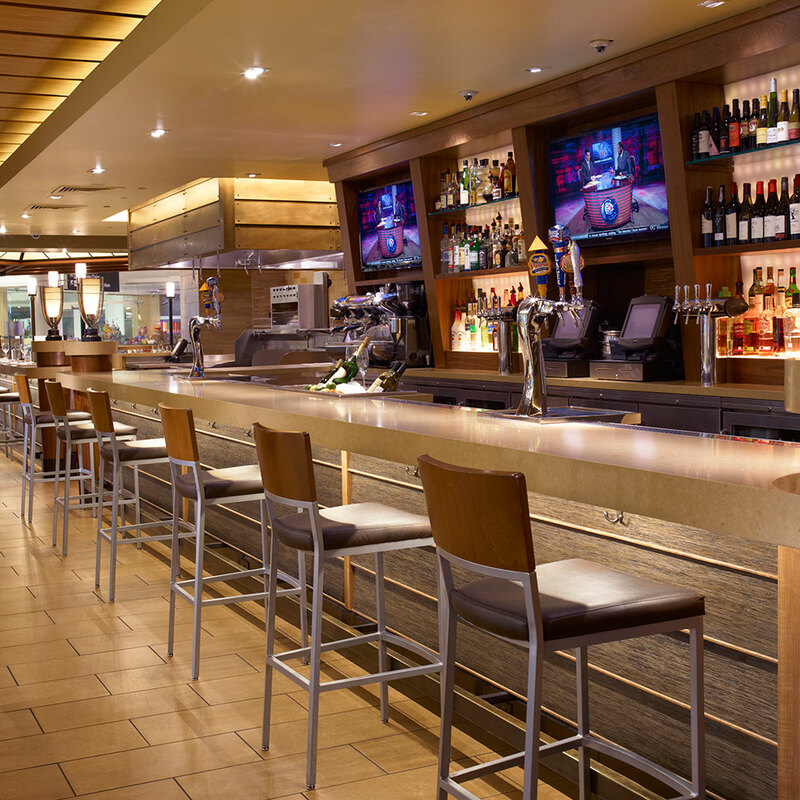 Terminal 2 • Lark Creek Grill has fresh sandwiches, salads, and large plates with highlights like Oregon Bay Shrimp Louis and Grilled Steelhead Salmon. 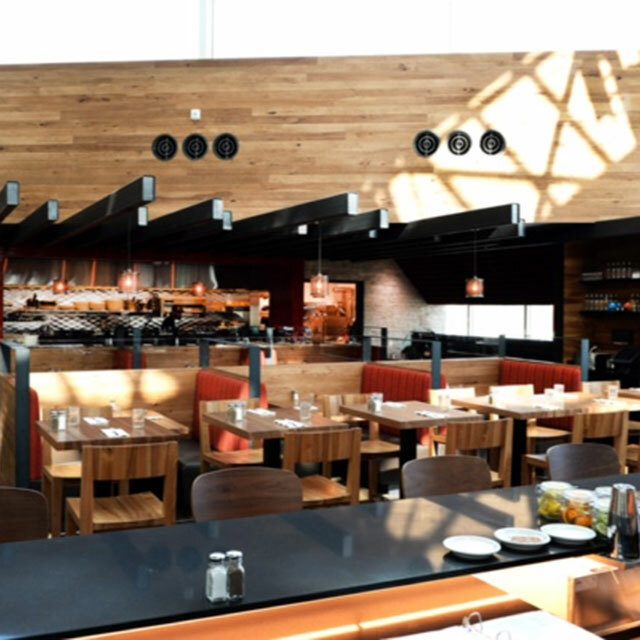 Terminal 2 · At the end of the terminal, Cat Cora’s Kitchen overlooks the runway and the Bay Area hills behind it, providing a serene dining setting. The restaurant is a good place for fresh seafood, which becomes extremely apparent when the lobster sitting in an ice-packed case in front of you waves his claw. 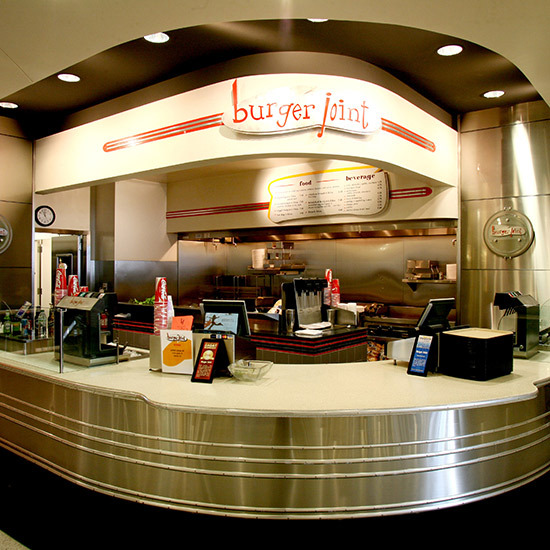 International Terminal · Burger Joint's offerings include a classic cheeseburger made from Niman Ranch Angus beef and fresh-cut fries. 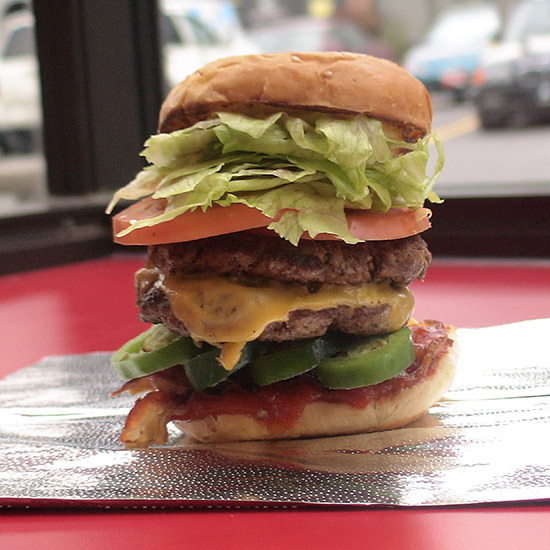 Free-range chicken sandwiches, veggie burgers (cooked on a meatless grill) and hormone-free hot dogs, as well as thick milkshakes made with local Double Rainbow ice cream, round out the menu. 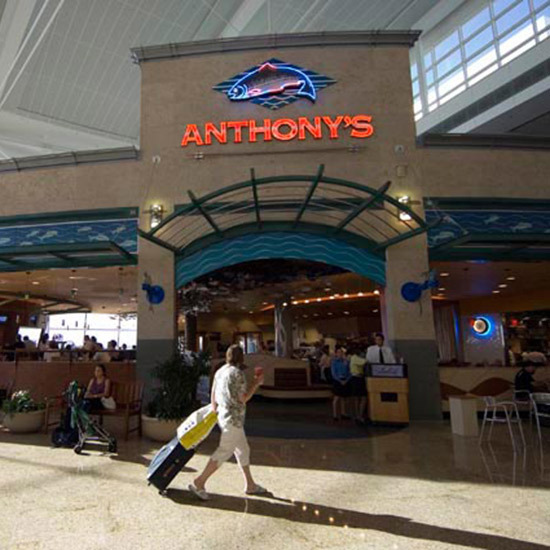 Central Terminal · Regional chain Anthony's is known for fresh local seafood and stunning views. 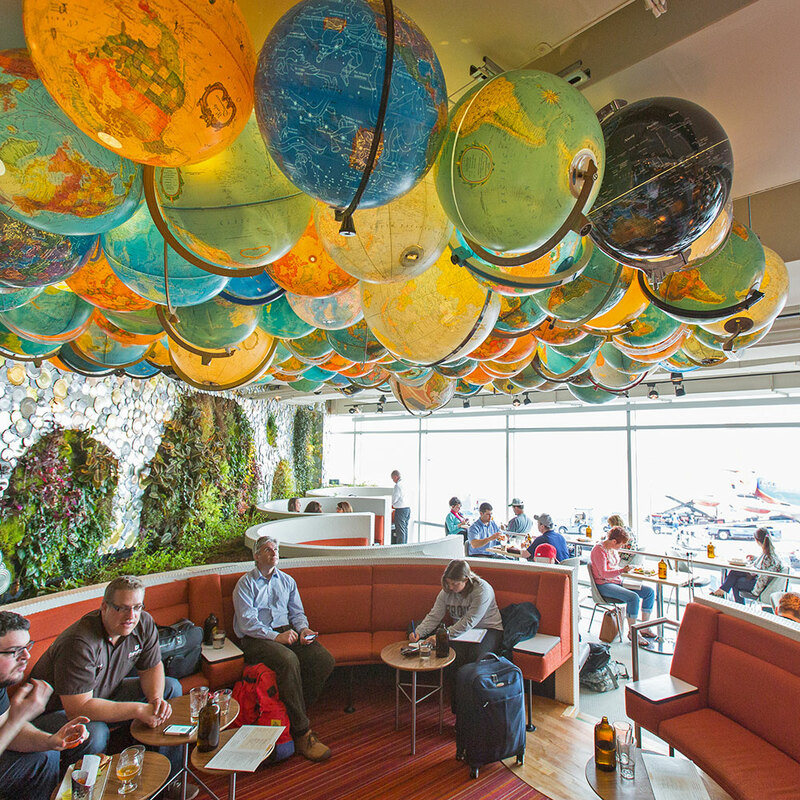 The Sea-Tac location is no exception, with dishes like Puget Sound oysters and the Olympic mountain range as a backdrop. Central Terminal, Concourse C • Pike Place Market institution Beecher’s Handmade Cheese has an airport cafe that offers soups, grilled cheese, and the “World’s Best Mac & Cheese” made with Beecher’s flagship cheese. Central Terminal · Dish D'Lish Fresh food by local celeb chef Kathy Casey upgrades the usual airport salads and sandwiches. Sample item: Kathy's D'Lish Favorite, a pressed sandwich with roasted chicken breast, brie and apple chutney. Concourse C • Neighborhood favorite Root Down’s airport outpost serves giant, fresh salads like the burrata panzanella and the Farm to Table Cobb. The menu lists its sources and producers whenever possible. For instance: the restaurant’s variations on the bento box, one of which includes chicken from Colorado’s Red Bird farms. 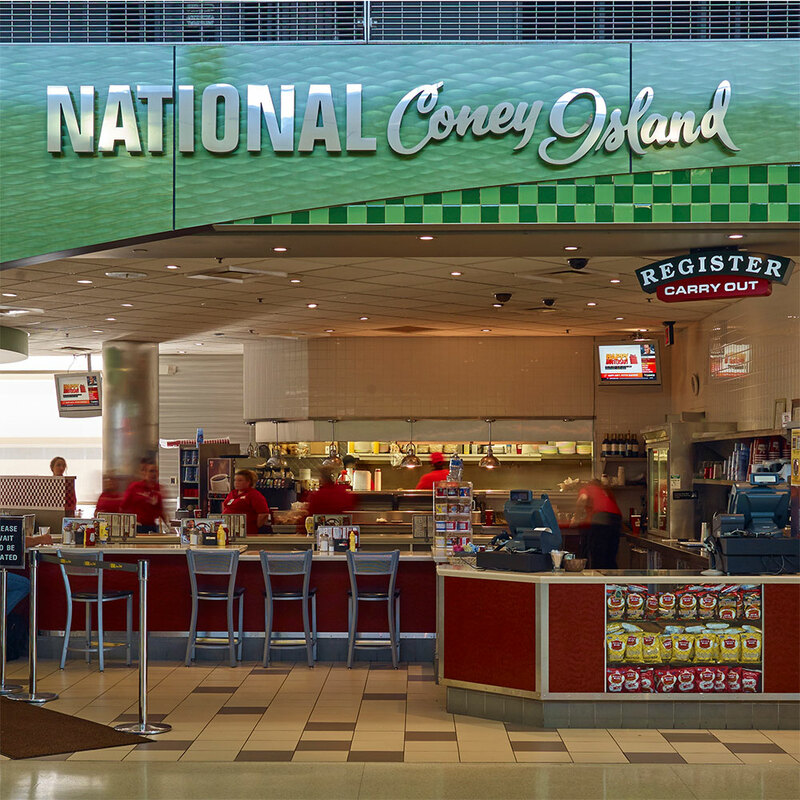 McNamara and North Terminals • National Coney Island has a lot on offer, including salads, burgers and gyros—but head straight for the National’s Coney Hot Dog. This Detroit classic is simple: a hot dog in a steamed bun topped with chili, diced onions and mustard.